As you know I love to get about when I can, discovering new things or rediscovering stuff. I love living in a bio-diverse region where the trip to the mountains or to the coast always sends a surprise encounter. Over the month so far I have seen so many wonderful things this world has, sometimes it may just be something that I saw that I found to be wonderous whereas others have just walked by probably thinking what the hell is that bloke doing with that camera. So…..this wander through my days I hope fills you with a bit of love for our nature and environment in which we inhabit as it does for me. I do find butterflies amazing creatures, as you probably have noticed as a lot of my blogs seem to have a butterfly or two. 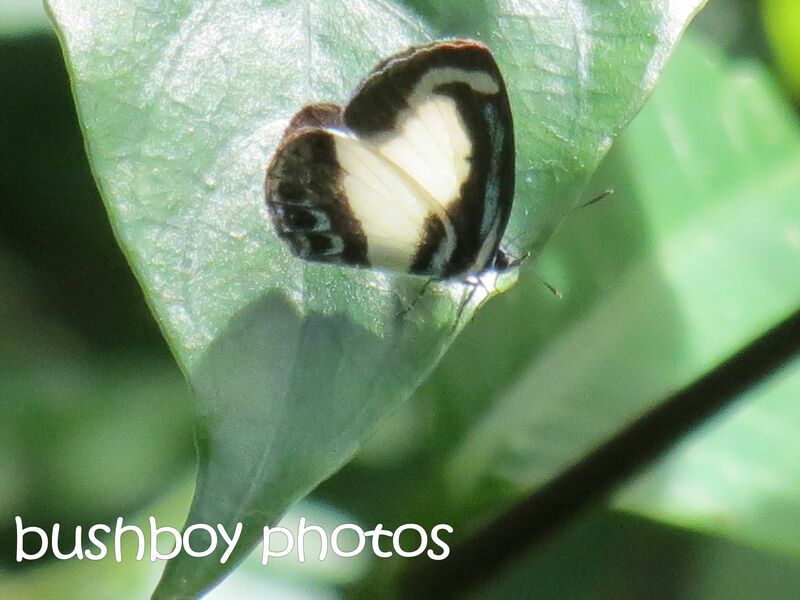 This small butterfly, about 17mm in size, has been whizzing around my besties garden and mine as well – a Small Green-banded Blue butterfly. I was wading through the water at Taylor Lagoon when all bout there were dragonflies zipping here, zipping there on their mission to do…..waht do dragonflies do when they zip about like that. Well after a while some settled on the sticks poking out of the water. Their irridecence was amazing to see. 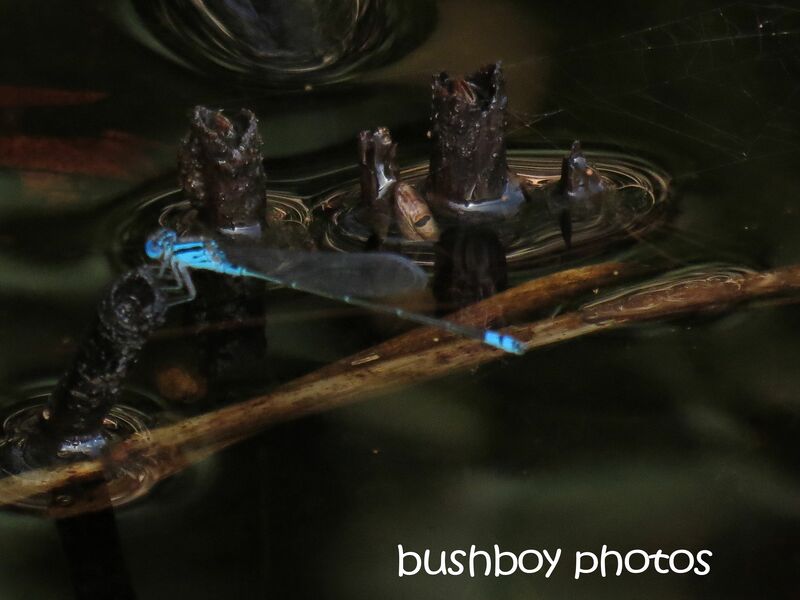 Unfortunately the dragonfly isn’t quite in focus but I love the effect of the water, don’t you? 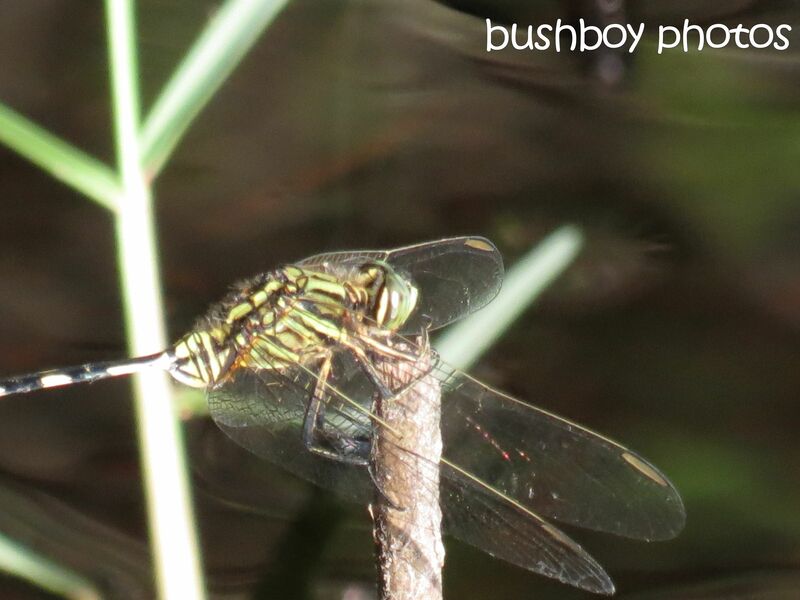 This dragonfly has a great grip on the stick. 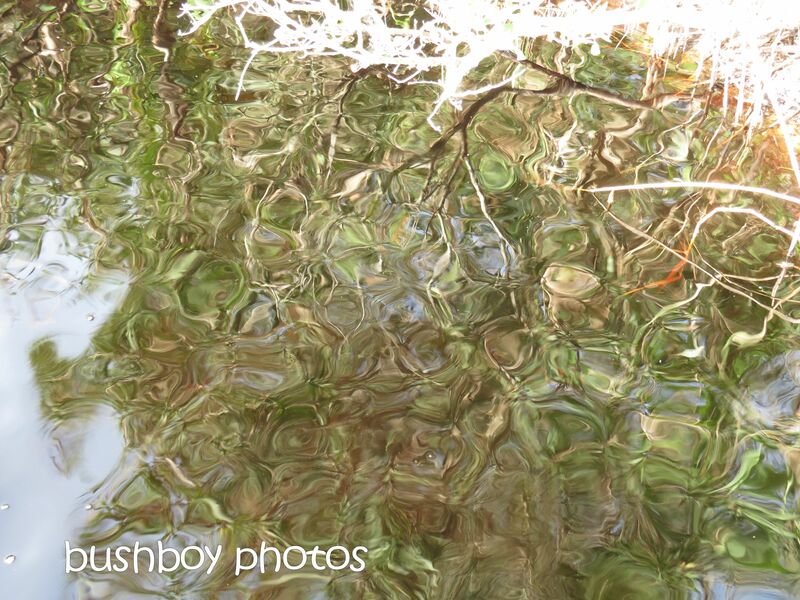 While wading in the shallows I looked at the water and the reflections of the over-hanging bottlebrush and sedges around the edge. I think it was facinating the way the image always changed as the water rippled and moved with the wind. This photo was my favourite of the couple I took. 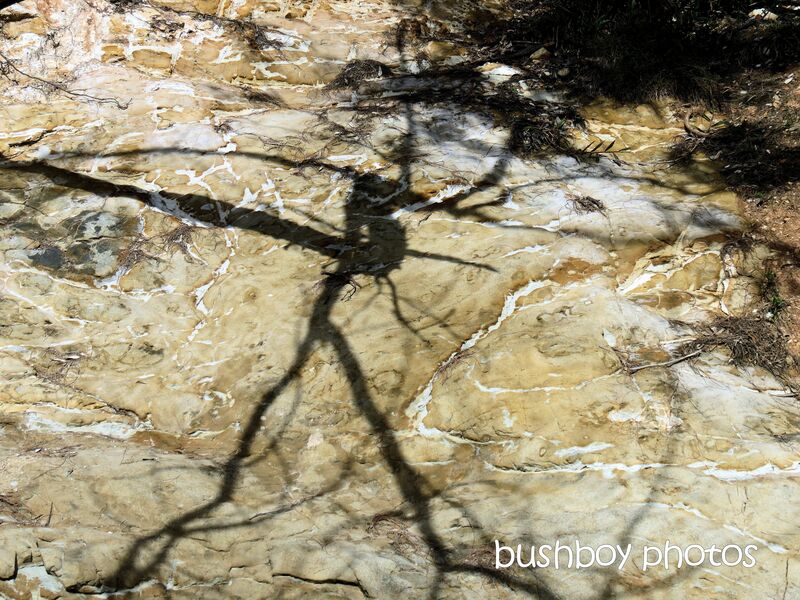 The shadow of the tree looked like it was walking across the rock face. What do you see? Shells. 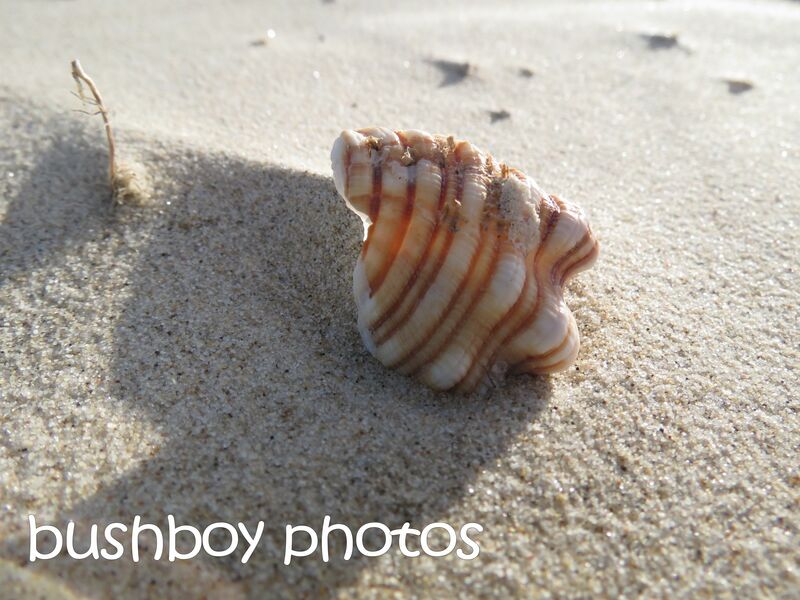 I love seeing the shells and stuff that is on the beach. 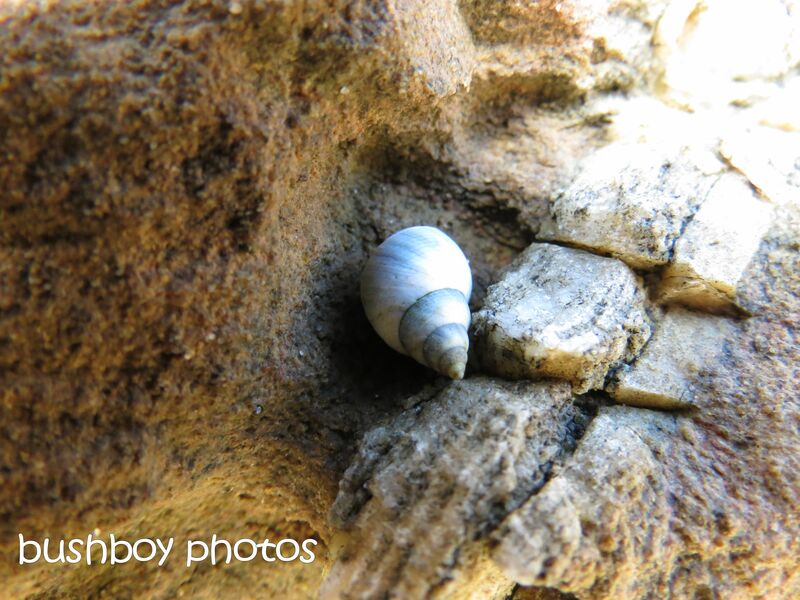 The light shining through the shell caught my eye form a distance. I wonder how the small creatures can survive when the tide is out or is it how do they survive when the tide is in? 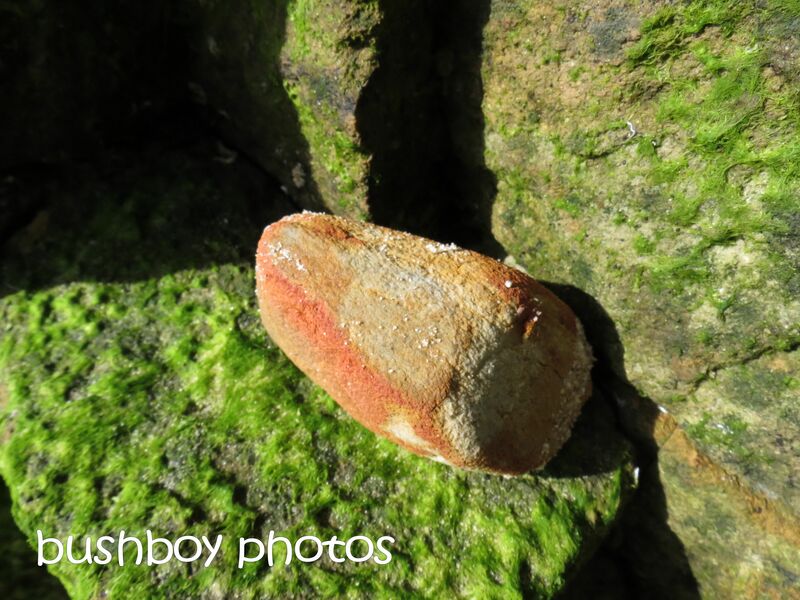 This one found a nice little niche in the rocks. 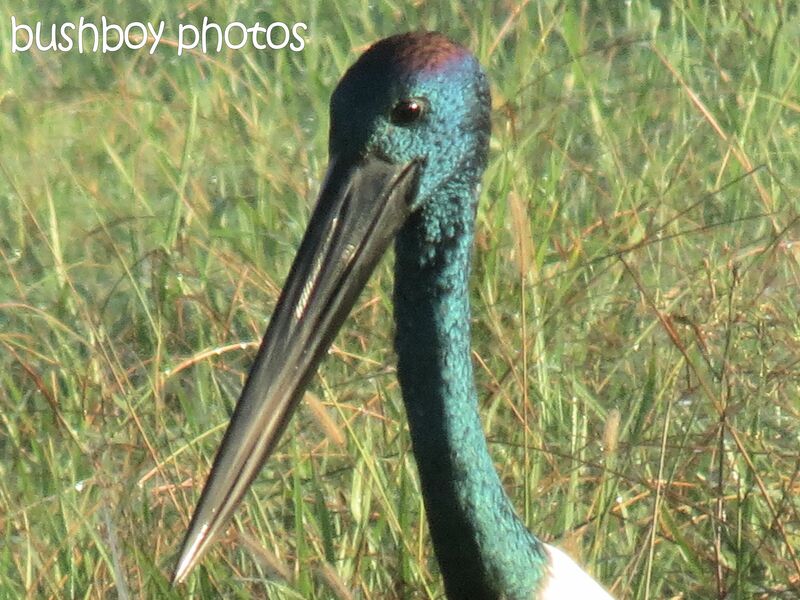 Aren’t the colours subtle but striking at the same time? 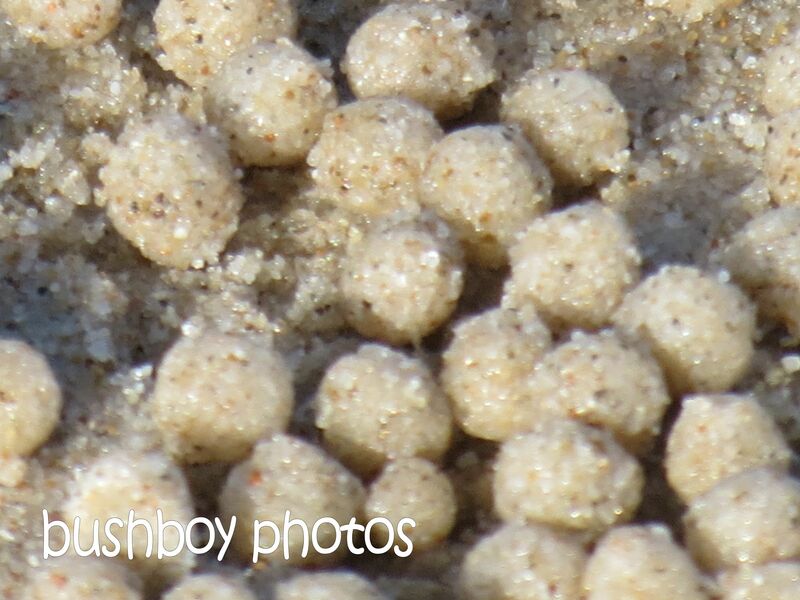 The number of tiny sand balls that were spread all along the shore was incredible. Some of the patterns made were so artistic. 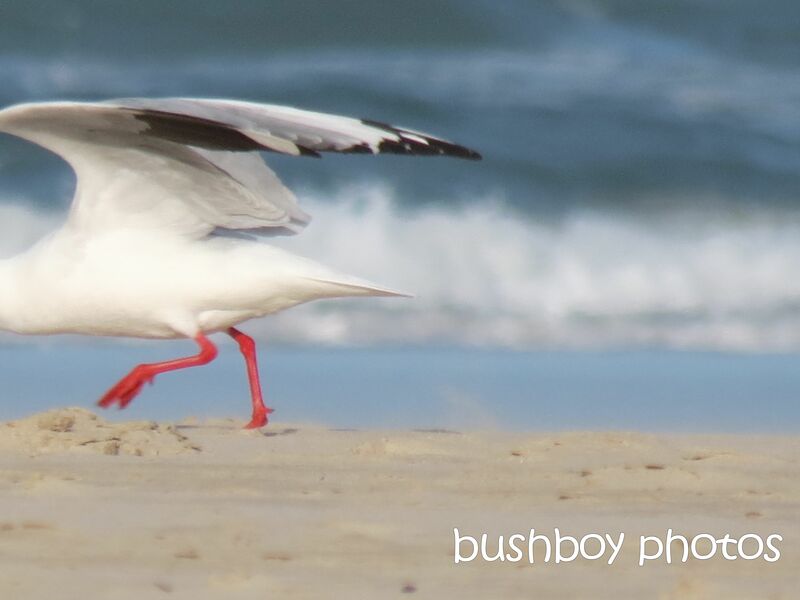 And here is the little bloke who spend a large amount of its life making those tiny sand balls. 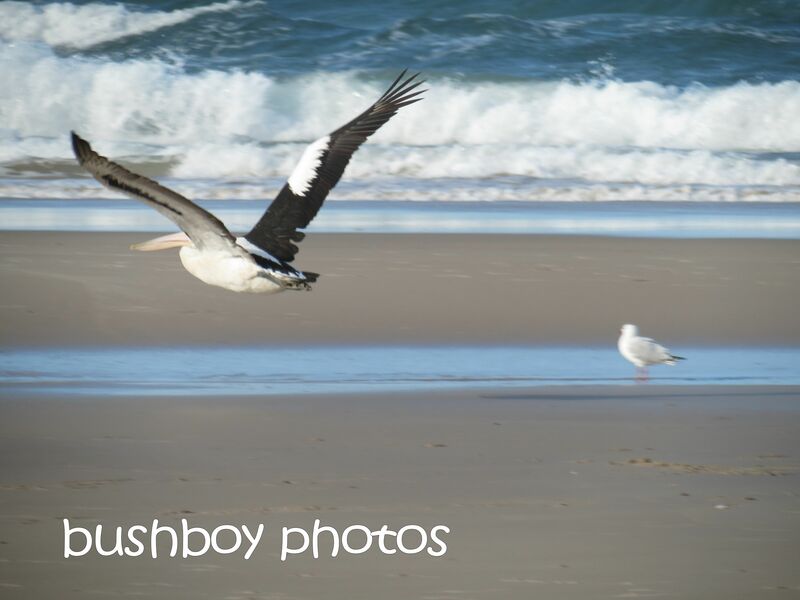 As I was walking along the shore, all of a sudden there was a whoosh and a couple of Pelicans came flying along looking for a place to land. They are so big up close. 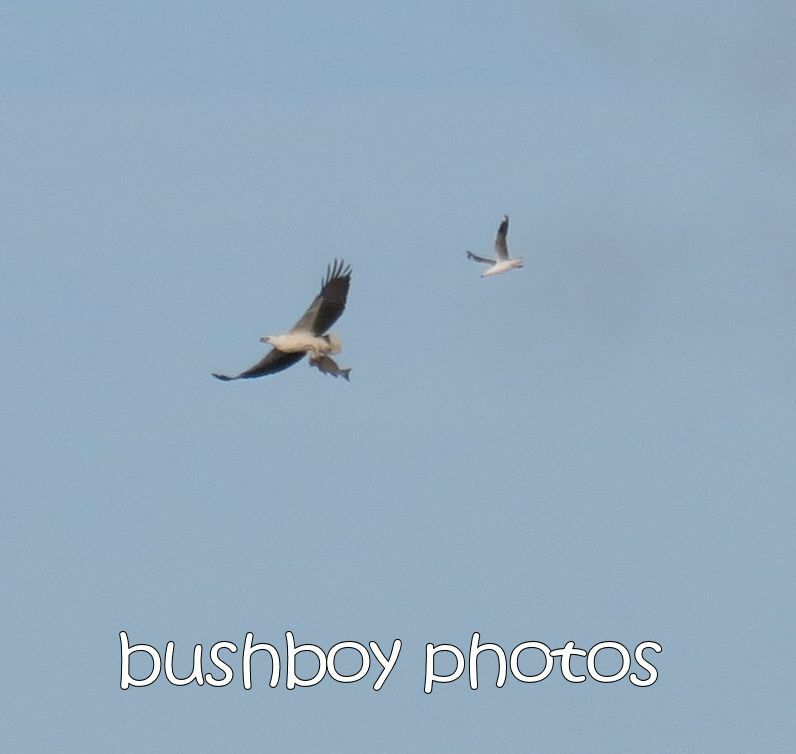 As we walked along the beach, we were discussing how we hadn’t seen any White-bellied Sea Eagles or Brahminy Kites, which are nearly always here. 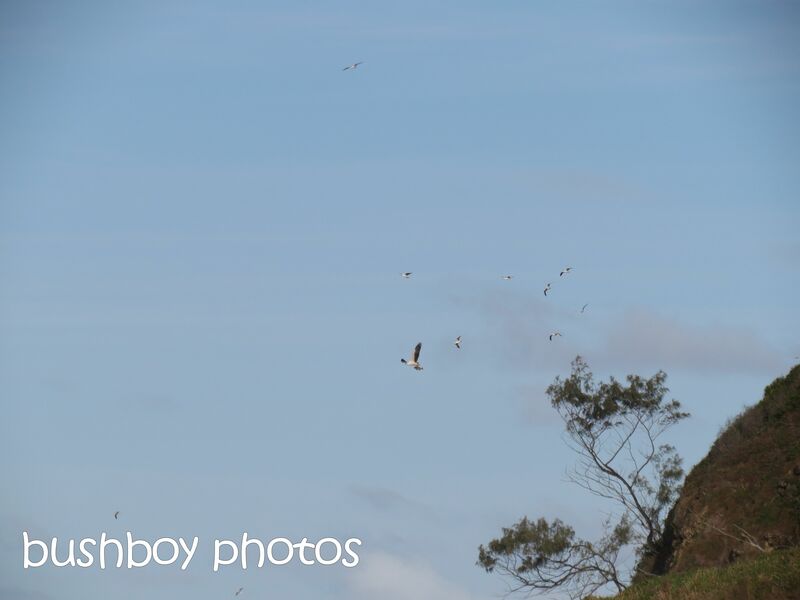 All of a sudden, at the other end of the beach, there was a commotion with Seagulls wheeling about and then appeared the Sea Eagle with a fish. Even with the lens at full stretch they were still a long way a way. 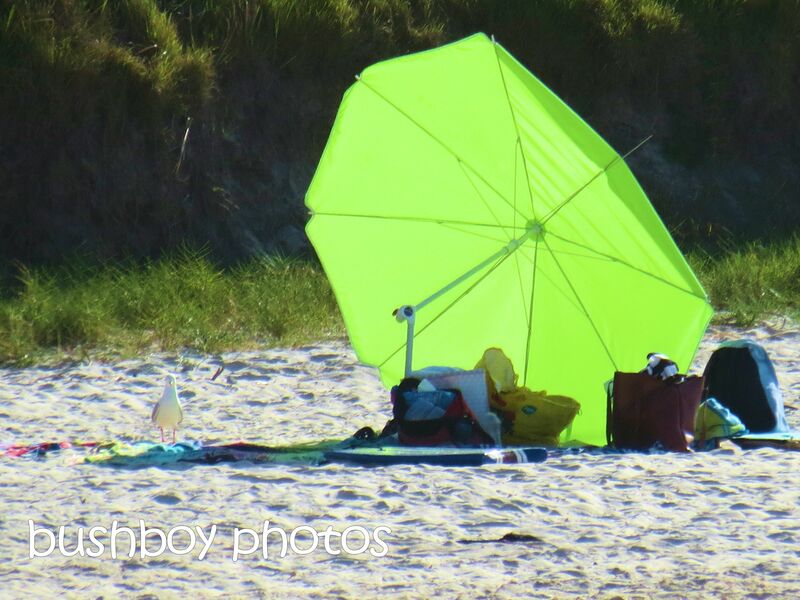 Here is a close up as best as I could manage. The image is heavily cropped just to show the size of the fish. 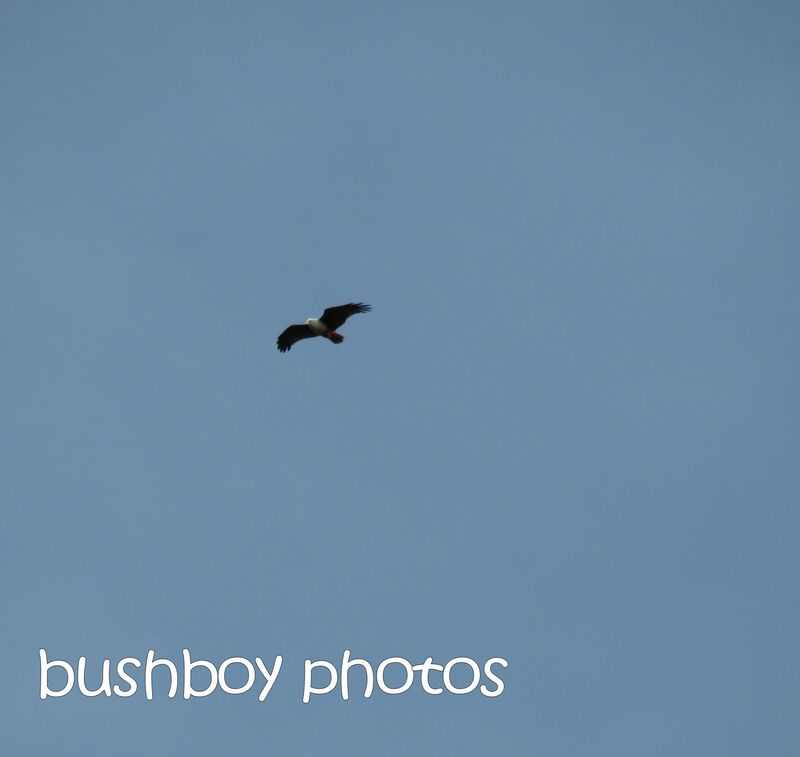 There was also another White-bellied Sea Eagle just soaring around the sky looking for it’s own fish. 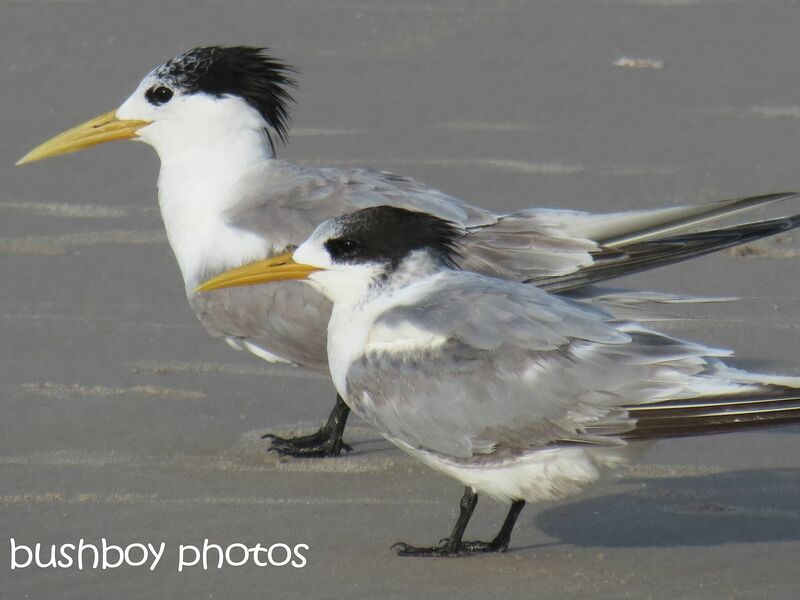 Meanwhile at the waters edge, a group of Crested Terns were having a bath and preening themselves trying to get their “hair” in order. 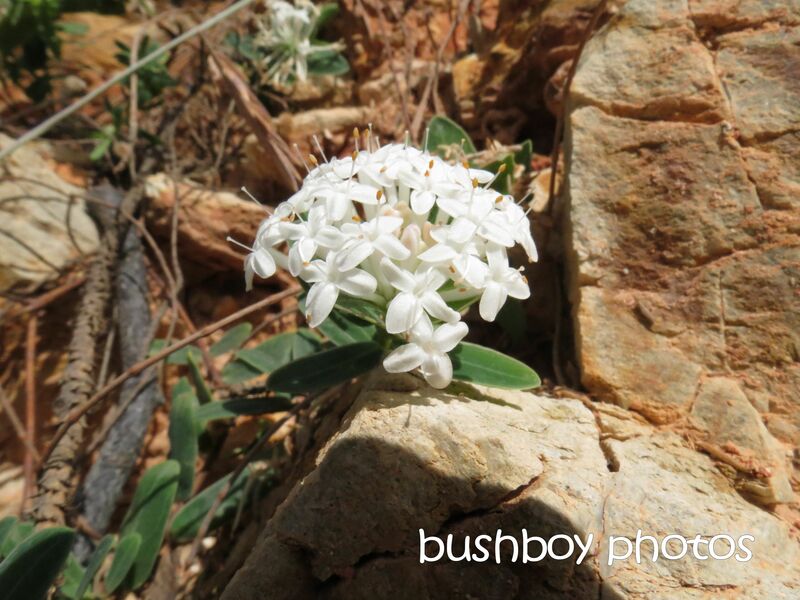 I have no idea what this plant is but the spots of white among the rocks certainly stood out. 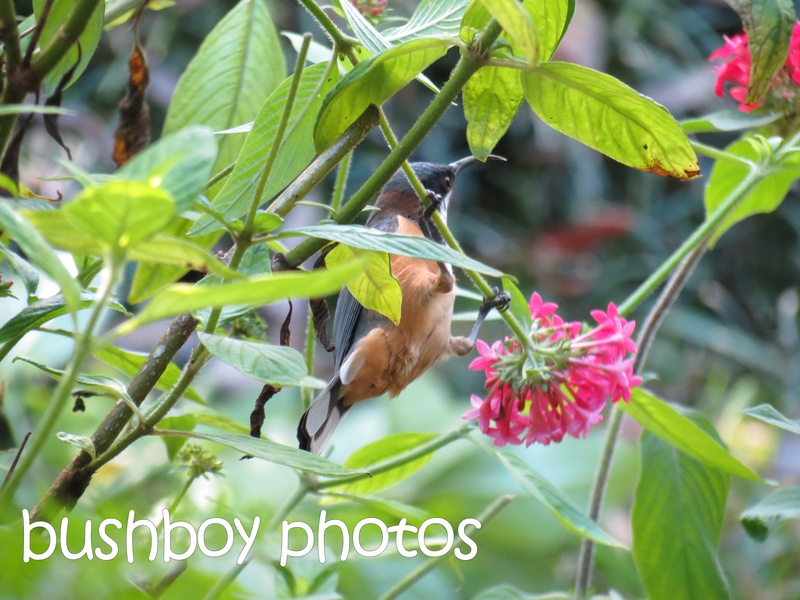 Even the Eastern Spinebill was too heavy for the Pentas making hanging on a bit of a chore. 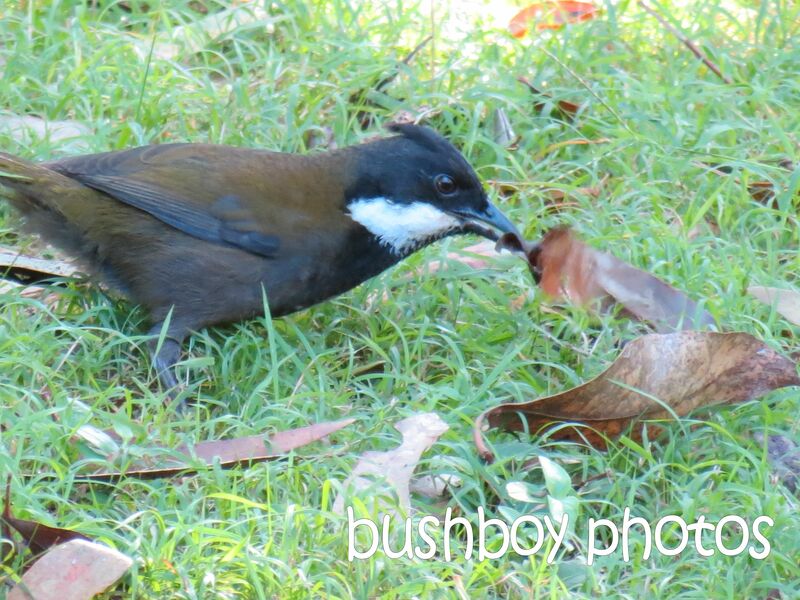 The Whipbirds are always pocking around in the garden, flicking over leaves and bits of bark to try and find some insects and bugs to snack on. 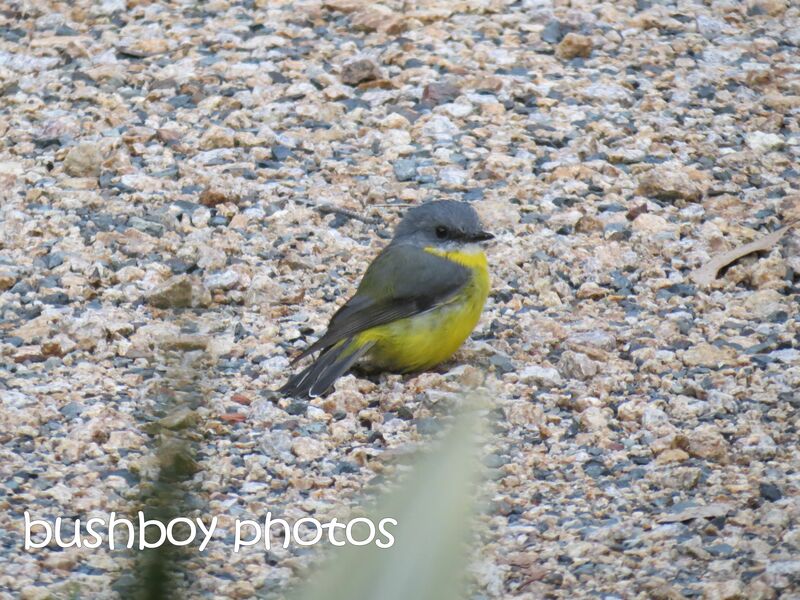 Over the past few weeks the Eastern Yellow Robins have seemed to appear in numbers in the garden. This one was sitting out front on the warm gravel early one morning. They are such sweet little birds. 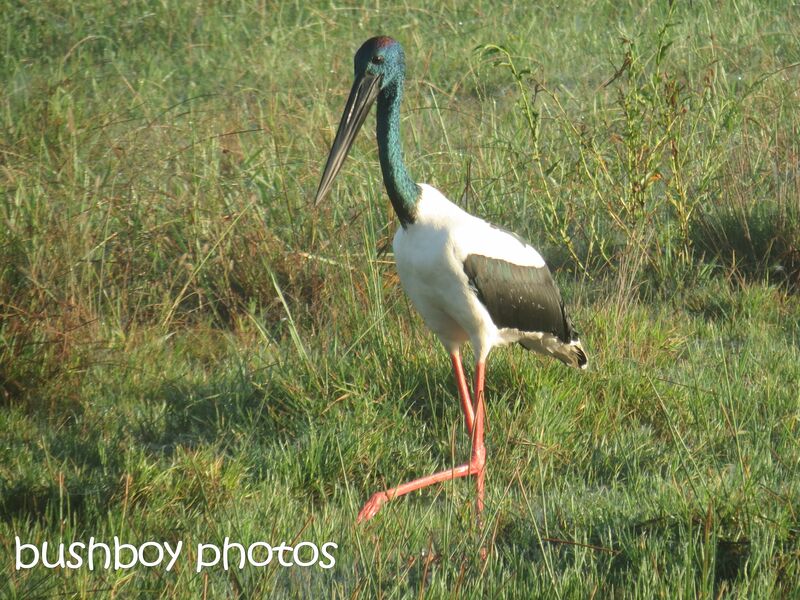 Heading into town early one misty morning, I spotted this Black-necked Stork (I really prefer Jabiru) stalking about the small pond where the “Tyre Turtle” lives. It was one of a pair. The other one was further back in the paddock in the ffog. Aren’t the colours great. I never noticed their red cap before either. 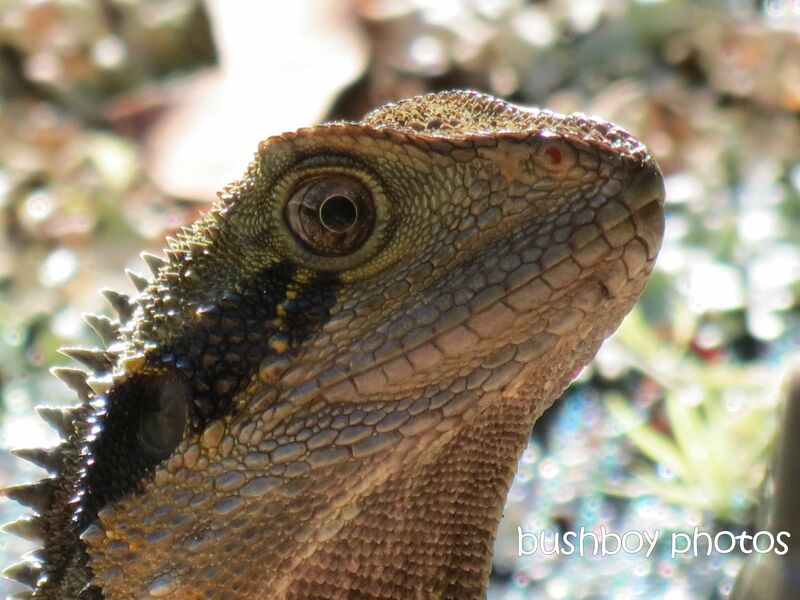 The Water Dragon has set up home in my besties garden. Such a lovely prehistoric looking creature. But they still enjoy a good laugh. Not really. He really enjoys a few bits of apple. The inside of his mouth is so pink. That’s the end of what I have found in April so far. Hope you enjoyed seeing what I have seen.